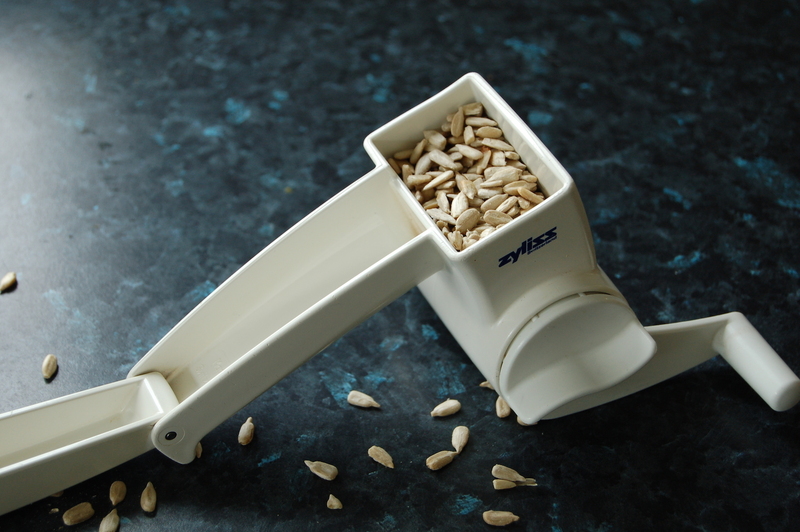 Works great on seeds, too! Time for another favourite kitchen tool. This time, the rotary grater. I loved this tool right from the start for grating parmesan cheese and nutmeg without taking off my knuckles, but it really captured my heart when I discovered what it does to nuts. Grinding nuts with a food processor or coffee grinder works well, but when both coffee grinder and food processor died several years ago, I resorted to doing it by hand with a knife. The process is tedious and yields poor results. Then I tried the rotary grater. It yielded the most beautiful, fluffy nut powder I’d ever seen. In fact, now that I have a food processor again, I still use the grater, because it does a better job.